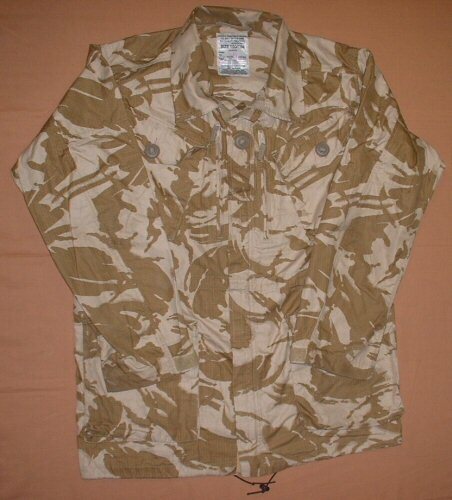 Soldier 95 ripstop combat jacket in desert DPM, recently produced for use the Iraq deployment. 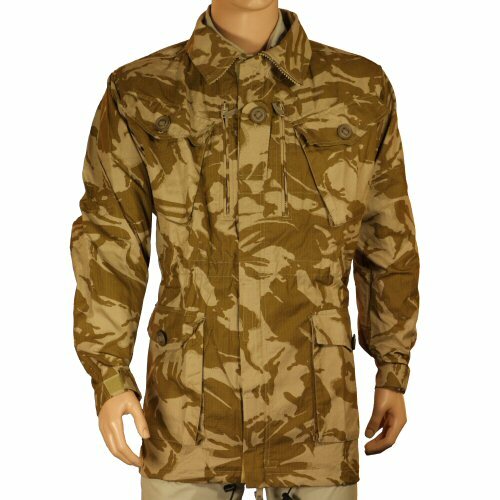 Made of medium weight high-tech ripstop material and works as part of the layered clothing system adopted by the British Army. Also ideal on its own for summer wear. This jacket features: newest ripstop cloth technology, zip and velcro front, two large zip chest pockets (one on either side of central zip), one commando-style chest tab for rank slide, two large expandable button down chest pockets, two large expandable button down waist pockets, tall zippable collar, drawstring waist and bottom hem, velcro cuffs. All buttons are new type Canadian tape buttons which do not fall off. Made to high standards demanded by the British Army NSN 8415-99-316-0087. Available options are: 38R , 38L , 40R . Full view of the front of the jacket.